Graphic Novel | Shelf Elf: read, write, rave. If you ask me, Binky is what might happen to Maru if he focused less on boxes, and more on the possibility that aliens could be trying to attack his family’s space station (house). Those who know me, know how much Maru means to me, so that is perhaps all I really need to say to tell you how much I love Binky, the crazy cartoon kitty, created by the always stylish, super-talented Ashley Spires. But honestly, I have many more reasons why I think The Binky Adventures are pretty much purr-fect (absolutely could not help it). Let’s make a list, shall we? 1. It’s got huge kid appeal, for boys and girls. Not just sayin’ this folks, I’ve got the banged-up, always coming-and-going copies in my school library to prove it. Some girls might be picking it up because Binky is just so darn cute, but they’ll stay because he is hilarious. There’s sweetness, but there’s also a little potty humour. In Binky Takes Charge, Gordon the dog may be leaving coded messages for the aliens (flies) in his business (um… poop). Now that will make kids laugh. 2. An average kid reader could finish a Binky book in one sitting, not rushing, just having a good time. 3. Spires’ artwork has such clean lines and a neutral colour palette that the expressions on the characters’ faces really stand out. Also, the uncluttered design of the panels will help readers to hone in on the story all the more. Plus, there’s something about Spires’ illustration style that feels modern and hip – and we all know how important it is for kids these days to feel modern and hip (*wink wink*). Perhaps I should say that Binky will score their hipster parents’ seal of approval? 4. It is becoming harder and harder for me to track down and stock enough graphic novels for the library that are appropriate for smart, book-devouring younger readers. I’m talking about kids in Grade 2/3/4 who are desperate to leap onto the GN bandwagon and who are really not ready for the content, length, and language in some popular GN series. Binky is perfect for that kind of kid. So not only are hipster parents cheering, it also gets the Cool Librarian’s Seal of Approval. In conclusion, Binky is for everyone from Grade 2 right on up to your crazy cat lady relative. 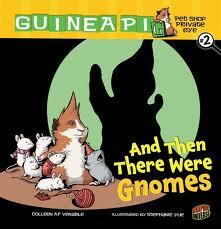 Read all four and you’ll heart Binky too. 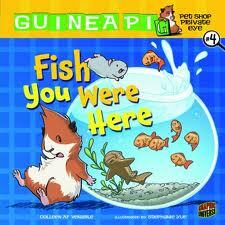 Binky Takes Charge and all the others in the series are published by Kids Can Press. 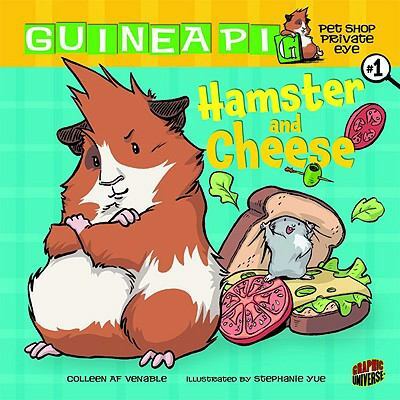 This entry was posted in Can-Con, Graphic Novel and tagged Ashley Spires, Binky, graphic novel, Kids Can Press on February 5, 2013 by shelfelf. 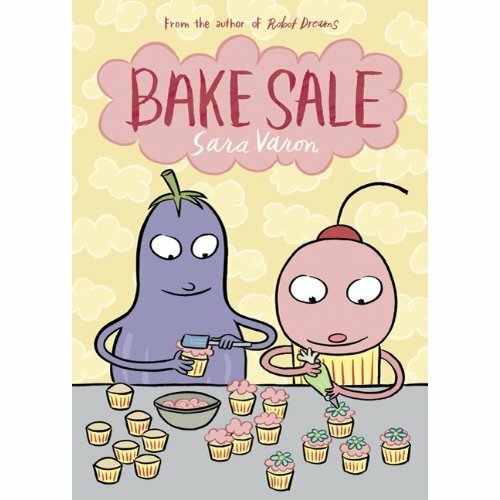 Bake Sale by Saran Varon is a quirky little confection from the talented lady who brought us the beautifully understated graphic novel, Robot Dreams. It is a treat to look at, and it has recipes from the story collected at the end, for any aspiring bakers out there. Bake Sale is every bit as visually beautiful as Varon’s previous graphic novel, but I confess, it’s not as satisfying when it comes to the narrative. I really wanted to love this book (I mean come on, look at that cover! A-dorable). 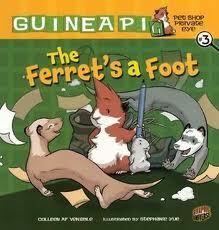 While I can say I love the soft simplicity of the illustrations, the storyline left me a little baffled. It’s never a good sign when it’s not easy to describe exactly what the book is about. Part of the problem for me here is I do not think that the concept is something that kids can connect to. They will see the cover and think, “I want to read this,” but then I’m afraid the story will leave some readers disappointed. Cupcake enjoys his life working in his small bakery, hanging out with his band mates, and spending time with his best friend Eggplant. He starts to slip into a baking slump, so Eggplant shares that he is planning a trip to Turkey and he promises that if Cupcake comes along he can introduce his friend to Turkish Delight (Cupcake’s baking idol). This prompts Cupcake to do everything he can to raise money for the trip, but Cupcake never gets to go because he ends up giving up his earnings to fund Eggplant’s trip when he loses his job. It feels like an odd and somewhat confusing combination of topics for a ten-year-old reader, right? The ending is very open, and I think that’s another thing that kids will find disappointing. I like an open ending. I find they are often the most realistic and rich endings in fiction, but this ending felt like an abrupt cut off, rather than a satisfying stopping point. The thematic threads related to following one’s passions, being selfless in friendship, and never giving up, are just not explored or developed enough to make this book completely successful. Cute? Certainly. I bought it for the library because of its sheer cuteness. (Wait until you see the endpapers – maybe the most delicious I have ever seen!) I’m just worried that the reading experience for most kids will be a let down, the way some pretty cupcakes look much better than they taste, which can be really upsetting. I speak from experience. So I’ll let you know the kid-appeal verdict soon. Bake Sale by Sarah Varon is published by First Second. This entry was posted in Art, Cute as all get-out, Graphic Novel, Illustration on January 27, 2012 by shelfelf. 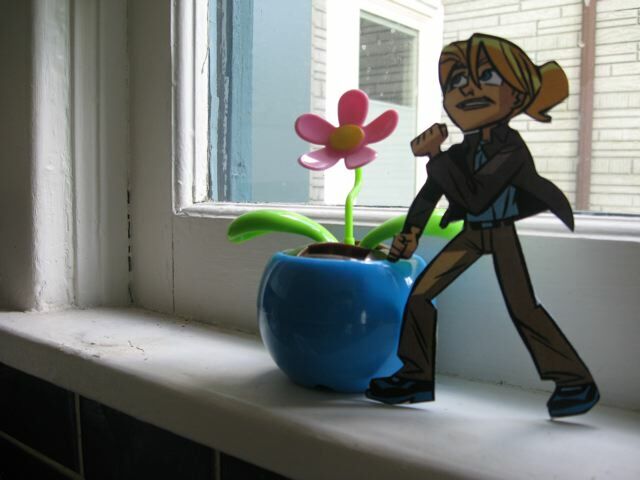 Welcome to Day 6 of Tundra Books’ Double Blog Dare Tour for J. Torres’ and J. Bone’s super-entertaining graphic novels, featuring the sassy and fearless tween adventuress, Alison Dare. Bring on the daring! Bring on the masked superhero and the evil baron and the lost treasure! First, here’s a bit on the author and illustrator dream team. J. Bone is an Eisner Award-nominated illustrator of several critically acclaimed comic books and graphic novels, including Spiderman: Tangled Web, Batman / The Spirit, and Paul Dini’s Mutant, Texas. J. Bone lives in Toronto, Ontario. 12-year-old Alison has been described as Indiana Jones meets Lara Croft, which basically means that readers are in for a wild ride, packed with a lot of humor and action. Alison is the daughter of a world-renowned archaeologist and the masked superhero The Blue Scarab, so it’s no surprise that she finds rule-breaking and a craving for dangerous situations come naturally. In each of the books, you’ll find several short adventures as Alison and her best friends face villains and save the day, making it all look as easy as their math homework. 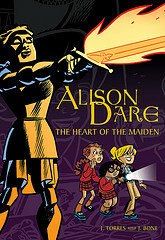 Alison Dare was nominated for an Eisner Award in the Best Title for a Younger Audience category, and I can see why. The books make a neat package, with fast-moving story-lines that will have you turning the pages and laughing too. They are a tad tongue-in-cheek, almost poking fun at the adventure-genre, which adds an interesting layer. The graphics are bold and not overdone, quite understated I think. I like that Alison has a wild imagination, and she’s fearless. It’s different to read an action graphic novel with a girl at the centre. At the same time, the book will certainly appeal to boy readers as well, what with the evil baron and the ninjas. I know that there will be many Alison fans when I surrender these titles to my gang of bookworms at school. They are speedy reads, perfect for summer reading in between swims. Tundra is running a fun/funny contest in connection with the tour. All you need to do is take a photo of Alison in your area and then send it to Tundra to be entered to win an Alison Dare prize pack. Instructions for all of that can be found here. You can continue to the other stops on the tour for today, and for all the rest of the tour days, by clicking here for the full schedule. Thank your to Tundra for supplying review copies, and for inviting me to be a tour stop. 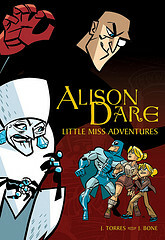 Both Alison Dare books are published by Tundra Books. 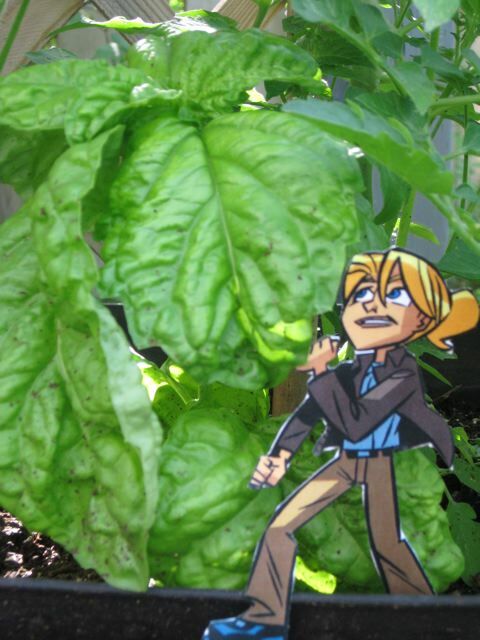 This entry was posted in Can-Con, Graphic Novel on June 14, 2010 by shelfelf. There has already been a lot of love for Raina Telgemeier’s autobiographical Middle Grade graphic novel, Smile. I just finished it today, and so it’s my turn to chime in. It really is charming and touching, from beginning to end, and if ever you had a tooth pulled as a kid, or had more than your fair share of ortho appointments, you’ll appreciate it all the more. In Smile, Telgemeier, the adaptor and illustrator of The Baby-sitter’s Club graphic novels, tells her own story of “family, friends, boys and dental drama,” and when she says dental drama, she’s not kidding. In her grade six year, after a night out at Girl Scouts, Raina fell and knocked out both of her front teeth. So began an incredibly long process of surgery and orthodontics and headgear and struggle for Raina back towards an ordinary smile. I hope that Raina’s book marks the beginning of many more quality graphic novels for middle grade girls, and readers would be lucky indeed if they were this well done, this emotionally true. At several moments while reading Smile I thought how right it was that Raina didn’t shy away from how miserable the middle grade years can be, when it seems like the only thing you’re really good at is being awkward. I think most readers will have a few moments of recognition. I know I would have been comforted to read this book at twelve or thirteen, when I might have recognized a little bit of my own life on the page. Smile is a heartfelt, pitch-perfect read, sure to find many fans. 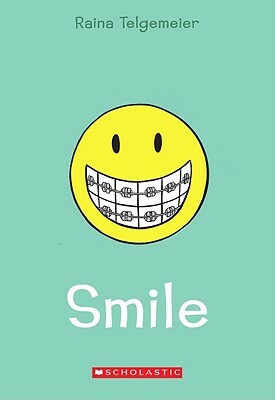 So go read Raina Telgemeier’s story and get your smile on (with braces or without). Smile is published by Graphix, an imprint of Scholastic. 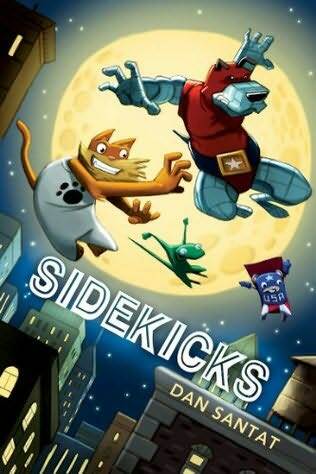 This entry was posted in Graphic Novel, Middle Grade on March 3, 2010 by shelfelf. 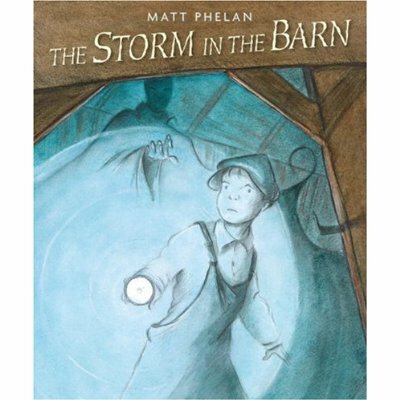 I’m honored to have the amazingly talented Matt Phelan visiting Shelf Elf today for an interview about his upcoming graphic novel, The Storm in the Barn. His book is already snapping up many glowing reviews all around the kidlitosphere (right here, educating alice, Reading Rants, Welcome to my Tweendom) and I wouldn’t be in the least surprised if it’s on a fast train to Awardsville. 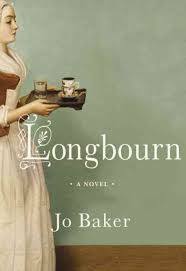 This is a book to buy and linger over and read again and again. Welcome Matt! How would you describe The Storm in the Barn to a potential reader? The Storm in the Barn is a graphic novel set in the Dust Bowl about a boy who discovers a sinister figure hiding in the neighbor’s barn. It is part tall tale, part historical fiction, and part supernatural thriller. What are you most proud of in this upcoming book? The story was first and foremost in my mind. I wrote it first as a very detailed script, describing each individual panel. I started to worry about how it would look only after the story was set. When you were working on this book, which came first, images or story? Although I wrote the script before I began drawing, the initial inspiration for the book was visual. I was very influenced by the WPA photography of that time and it was those images of the Dust Bowl that started me thinking. Also, the villain of the story originated as an offhand doodle that I once made during a meeting at my old copywriting job. In what ways do you think a typical urban kid in 2009 can relate to the experiences of Jack Clark, a kid growing up in the Dust Bowl? I think Jack faces some universal challenges of being a kid: bullies, a feeling of uselessness, the desire to impress his father, the desire to save his family. I think most kids can relate to that feeling of being powerless yet wanting desperately to make things better. The Wizard of Oz is an important element in The Storm in the Barn. Why did you choose to bring this text into your book? What did you hope it would add to the fabric of your story? This entry was posted in Crossover Books, Graphic Novel, Illustration, Interviews on August 3, 2009 by shelfelf.